The next major contributor to development was H.J. Lindon in 1862 he produced one of the first stable inflatable rubber bladders. This enabled the size and shape to be be regular and therefore made the ball strike truer. There are stories that Lindon was inspired to manufacture a bladder other than pig because his wife died of lung disease contracted by blowing up to many animal bladders. Whatever the reason for doing so it created a very strong and consistent shape to the ball. 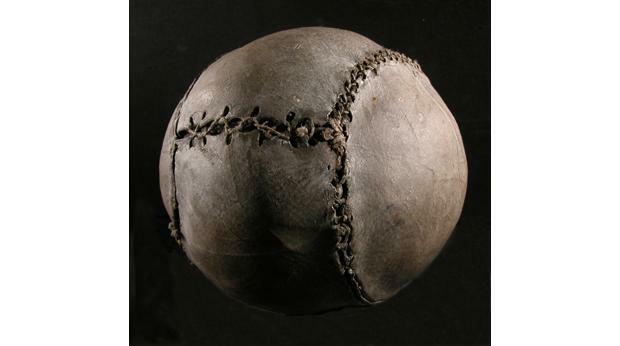 Despite this revolutionary leap in design, most soccer balls still used a pig bladder covered in leather till the 20th century. The next year 1863 saw the coming together of the English Football Association to write the rules for their newly founded group. The first set of rules written were quite loose and contained no reference to the dimensions of the ball. 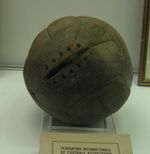 However in 1872 they met again and the rules were rewritten and the balls dimensions decided upon “ the ball must be spherical with a circumference of 27 to 28 inches with a weight at the start of the game of 13-15 ounces “ This is still very much in force today with FIFA, the only change being in 1937, the weight increased to 14-16 ounces. The 1953 edition of the English Encyclopedia of Football states “According to the Laws of Football, the ball must be spherical with an outer casing of leather or other approved materials. The circumference shall not be more than 28 in., nor less than 27 in, while the weight at the start of the game must not be more that 16 oz., nor less than 14 oz.” They still read the same regarding ball specifications. There is very little documented about the soccer ball probably because it has changed so very little over the years. Size and weight have remained constant only the construction materials and design have changed. 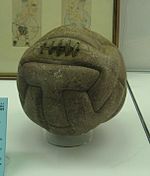 The Scots would argue that that Scotland is the home of football they certainly have the oldest surviving ball. They are definitely responsible for the start of large scale manufacture of soccer or match balls. With the advent of the English League in 1888 and the Scottish in 1890, two companies Thomlinson and Mitre were at the cutting edge of ball production. These firms maintained that the main quality required of a match ball was that it kept its shape. They stressed that the abilities of the cutters and stitchers and the durability of the leather were key to shape retention. For premium balls the rump leather was used as it is considerably thicker. For every day lower standard balls, they used the hide from the shoulder. Ball design was continually tweaked and advanced from ovoid strips going from pole to pole, to perpendicular panels locked together. This made the shape a cleaner sphere which not only looked nicer, but but gave the ball more stability, a truer flight and a much tougher construction. The 20th Century cemented the use of the rubber bladder with a leather cover. By the 1900’s most balls used this format. With stronger rubber being used the pressure could be increased, creating a ball that not only bounced better but extended its durability and ability to withstand the rigors of the game. An inner tube covered with tanned leather was the usual style. At first eight panels were used then going up to 12, eventually eighteen individual strips of tough hide were stitched together in a pattern of three by six. All hand stitched with 5-ply hemp, the covers were constructed inside out with a section left open to be laced up after the bladder was inserted leaving all the stitching hidden internally. Once the un-inflated bladder was inserted with the long stemmed neck protruding from the unstitched slit the ball was ready to be blown up, the neck was then inserted in the slit and the opening laced up. It is no surprise that these balls were being continually re-inflated, quite often during a game. While these balls were great for kicking heading the ball was a painful exercise. The strong stitching and the fact that the leather got very wet during the inclement British weather meant a very heavy ball. This often resulted in head injuries some quite bad. Due to the differing thickness and quality of leather these old balls could rapidly deteriorate with water affecting the condition of the leather. The games had to have been affected as these soccer balls would become a lot heavier and more difficult to control. One famous example of a game’s outcome that could be put down to the ball used, was the very first world cup in 1930. Played between Argentina and Uruguay an argument ensued and two balls had to be used. Argentina won the toss and chose the ball for the first half Uruguay the second. At half time Argentina were ahead 2-1 with Uruguay coming back to take the victory 4-2. The balls used were markedly different in construction so it is not difficult to draw the conclusion that they made a difference. During the next twenty years very little changed the shapes of the panels were experimented with and around the time of the second world war a carcass was introduced between the bladder and the leather cover. Made of tough cloth this considerably strengthened the design, gave a cushion between the vulnerable rubber and leather, and helped control the shape too. However balls still deflated and were known to burst during games. Post war balls were particularly bad the quality of which was blamed on very thin leather. The problem of waterlogged balls was somewhat addressed with the introduction of synthetic coatings on the leather covers.